We believe that in order to make the biggest difference to the community, it’s important to give back. We want to make a positive impact for vulnerable or underprivileged local people that need help with IT and communications the most. We all know someone that needs help with their IT … even if it’s just providing some time. 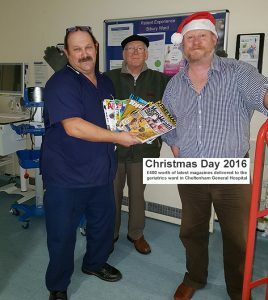 £400 worth of magazines handed out to elderly people at Cheltenham General Geriatrics ward on Christmas day.